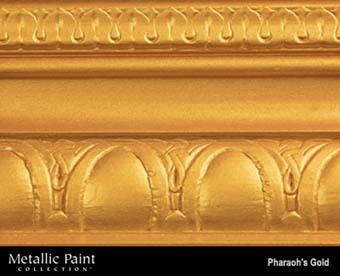 DiscountPaint.net :: MANUFACTURERS :: MODERN MASTERS :: Metallic Paint Collection :: MODERN MASTERS METALLIC PAINT 92006 ME-660 PHARAOHS GOLD SIZE:1 GALLON. MERIT PRO 2293 9" X 3/8" ONE COAT ROLLER COVER PACK:6 PCS. INSLX IN20795 PS 8000 WHITE PRIME LOCK PLUS VOC COMPLIANT ALKYD PRIMER SEALER STAIN KILLER SIZE:5 GALLONS. MODERN MASTERS PSMP713-32 COOL AQUA PLATINUM SERIES METALLIC PLASTER SIZE:QUART. SHEFFIELD 4541 #112 BURNT SIENNA MASTER PAINTERS TINTS ALL SIZE:PINT. MAJIC 8-0073-1 BLACK INTERIOR EXTERIOR OIL BASE FLOOR PAINT SIZE:1 GALLON. RUSTOLEUM 249077 SPRAY SATIN GREEN APPLE PAINTERS TOUCH 2X ULTRA COVER SIZE:12 OZ. SPRAY PACK:6 PCS.